You are here: Home / The Exhibition / Be Kind to Animals Week® and Humane Sunday / Photograph from Taunton, Mass. This photograph was taken in during the Be Kind to Animals Week® celebrations in Taunton, Massachusetts and was published in Our Dumb Animals in March of 1927. 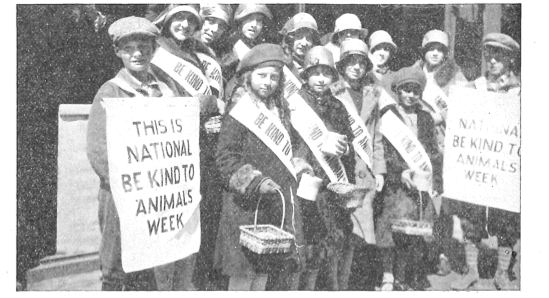 As part of the celebrations depicted here, the Animal Welfare Workers of Taunton, Mass., held a fund-raising “tag day” which the children in the photograph assisted with. According to reports in Our Dumb Animals, a “substantial sum” was raised through these efforts. In addition, 42 stores in Taunton agreed to display window cards advertising Be Kind to Animals Week®, posters were placed in classrooms throughout the region, and the local theatres showed slides promoting both the events and the themes of kindness and humane treatment of animals. These activities were co-ordinated by Mrs. Howard F. Woodward, the President of the Animal Welfare Workers in Taunton, Mass.